I'm going to say that today I got very, very lucky at an antique store. I stumbled on a stack of hand-pieced quilt tops, all in perfect condition, most priced around $25. I bought these three for $60 (by the simple expedient of asking for a discount). 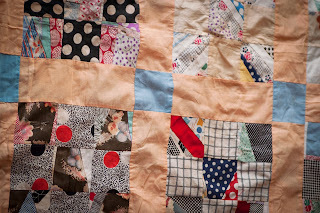 I am so excited about quilting them by hand, especially the middle one here. Lucky you! Scrappy quilts are great; I like to imagine where all the fabric came from. Have fun with them. How wonderful! I wish I could come across such a find! Enjoy them. What a great find! Yes, have fun and please show us the finished quilts! Very exciting! The middle one is especially pretty. 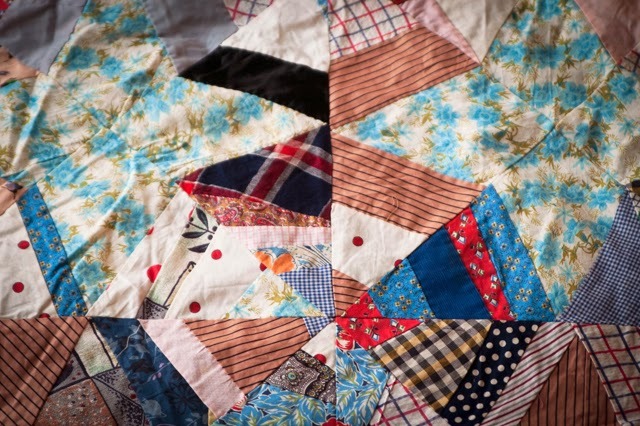 Oh, the middle quilt is lovely! 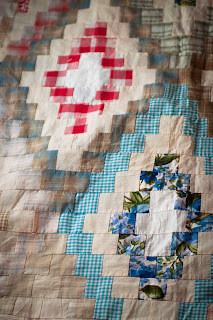 I have been wanting to do a block quilt with red and white blocks and this looks like a wonderful, easy pattern. Yes, keep safe in your home while the storm comes, happy sewing! Yay! At least your busy in the ice storm.